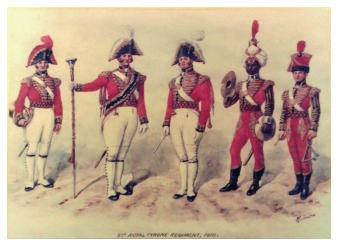 Band-Master, Drum-Major and Musicians of The Royal Tyrone Regiment wearing State Dress, circa 1810. The Tyrone Militia was formed with Lord Abercorn as its Colonel and one of his first acts was to apply for the distinction ‘Royal’ for his regiment. This was granted quickly and the unit became the Royal Tyrone Regiment of Militia from 17 April 1793. In August that year the regiment was embodied and remained so until May 1802. During their first period of embodiment the Tyrones took part in the battles against the United Irishmen in the 1798 Rebellion. The Light Company saw most action and fought at Athy and Narraghmore in County Kildare on 24 May and at Ballymore Eustace the following day. In both engagements the Tyrones’ Light Company was the sole government force involved. It was next engaged at Tuberneering in County Wexford on 4 June where it fought alongside the Armagh, Antrim and North Cork Regiments as well as the Grenadier Company of the Londonderry Regiment. On 9 June it served alongside the Armagh and North Cork Regiments again, as well as the Cavan Battalion and the Londonderry Grenadiers. The final engagement for the company was at Vinegar Hill on 21 June where it was part of a much stronger government force that included the Sligo, Meath, Roscommon, Antrim, Armagh and Dublin County units as well as the Londonderry Grenadiers and the 1st and 4th Light Battalions of the Militia. The last named battalions were temporary units formed initially as an anti-invasion force from light companies of a number of Militia units. The Royal Tyrone Regiment also formed a band that not only provided music on the march but would play at formal official occasions. It also played at a party in Wexford to celebrate the birthday of the politician and poet George Ogle and ‘contributed not a little in detaining the joyous party to a late hour next morning’ while, in 1809, it also accompanied the lord lieutenant on the Grand Canal; the band, in full uniform, were on ‘a small and elegant passage boat’ that attended the vessel carrying the lord lieutenant. In common with the other Militia units the Tyrones were disembodied for a time after the Treaty of Amiens but were called back to service in May 1803, remaining embodied until 1816. Reduced to cadre for the next 39 years, the regiment, now the Royal Tyrone Fusiliers, was embodied again in January 1855 after the outbreak of the Crimean War for a period of service that lasted until August 1856. For the soldiers of this period most of their service was in England and the long marches of earlier times often became railway journeys while steam ships were replacing sail. The regiment had been disembodied for just over a year when it was called back to service in November 1857. This embodiment, for the Indian Mutiny, lasted until May 1858. After that the regiment reduced again to cadre. The Queen’s Colour of The Royal Tyrone Fusiliers Militia Regiment, 1870 (left). In 1881 Childers’ reforms of the Army, especially the infantry, were implemented. New territorial regiments were created, usually by combining two existing battalions, to which were added the militia battalions of the regiment’s recruiting area. Thus the 27th (Inniskilling) Regiment and the 108th (Madras Infantry) Regiment were amalgamated to form the Royal Inniskilling Fusiliers. The Royal Tyrone Fusiliers formed the 4th Battalion. At first the Tyrones amalgamated with the Londonderry Light Infantry to form the 4th Inniskillings but the Londonderrys were soon removed from the new battalion to re-form as an artillery brigade. During the Second South African, or Boer, War the 4th Inniskillings were embodied on 2 May 1900 but the embodiment lasted only until 18 October when the battalion was again stood down. The overall performance of the Army in the Boer War led to a major review of its organisation and to the Haldane Reforms that included the creation of the Territorial Force in 1908. The Territorial Force was not extended to Ireland where the Militia survived under the new Special Reserve title, although a number of battalions were disbanded. The Tyrones survived and were redesignated as the 3rd Battalion, swapping precedence with the Fermanaghs and becoming the Depot Battalion. Since the Regimental Depot was in Omagh, the county town of Tyrone, it was logical that the Tyrones should provide the Depot Battalion. With the outbreak of the First World War in August 1914 the 3rd Battalion became a recruiting and draft-finding unit while also providing a base for men who were unfit for active service, including those recovering from wounds after their discharge from hospital. Such battalions also became temporary homes for young officers who were judged too young for front-line service. Perhaps the most famous soldier to serve in 3rd Inniskillings was the poet Francis Ledwidge. Known as the ‘peasant poet’, the ‘soldier poet’ and the ‘poet of the blackbirds’ Ledwidge had seen action with the Inniskillings in Gallipoli but suffered a back injury whilst serving in Serbia. After treatment he was posted to the 3rd Battalion in Ebrington Barracks, Londonderry, where he became batman (servant) to Lord Dunsany who had been his patron since 1912. On completion of his recuperation, Ledwidge was posted to 1st Inniskillings in France. With five other men of a road-laying party he was killed by a single shell whilst enjoying a tea break in a shell hole on 31 July 1917, just before the opening of the Third Battle of Ypres. The Welsh poet Hedd Wyn was also killed that day and both lie in Artillery Wood Cemetery, Boesinghe. The Irish reserve battalions were moved to England in 1917 and, with the end of the war, were again reduced to cadre in 1919. They were little more than names on the Army List for the remainder of their existence although the Special Reserve was renamed Supplementary Reserve in the 1920s and this in turn became the Army Emergency Reserve after the Second World War. Not until 1953 were the old Militia battalions finally removed from the Army List. As a result of their existence, if only on paper, in 1947, the newly-created Territorial Army battalion of the Inniskillings was designated the 5th Battalion as both 3rd and 4th Inniskillings were still on the Army List.